In a funk? Looking for a more contented feeling? Here's a simple solution: Keep a gratitude journal to record the positives in your life. Taking a few moments to keep a gratitude journal on a regular basis can make a difference in your outlook. Keeping a gratitude journal—where you regularly write down some of the things you are grateful for—is all the rage right now. But this simple little habit is no fad. Solid evidence shows that training yourself to focus on the positive things in your life—even the very little things—can help you lead a more contented life. Using a habit like journaling, you can train your mind to focus on gratitude and positivity, which helps counteract negative feelings like envy, regret, and depression. “There really is research on this,” says Julie G. Kays, MS, LCPC, NCC, a licensed and Board-Certified Clinical Counselor at The Counseling Center at Stella Maris in Timonium, MD. It isn’t possible to be happy all the time. Life has its natural ups and downs, but learning to navigate those ups and downs by practicing gratitude can help you lead a contented life, which is a more realistic goal. Don’t leave those notebooks blank. Put your pen to use by keeping a gratitude journal to log life’s positives. A gratitude journal simply means that you write down the aspects of your life for which you’re grateful, and that you do it on as regular a basis as possible. It really is that simple. Your gratitude journal entires can be several paragraphs or sentences, or one sentence or even one words—whatever works for you. Kays recommends doing it at the end of the day, as it can put you in a positive, soothing frame of mind that may help you sleep. But you really can do it any time that’s convenient, she notes. The standard goal is to identify three specific things you are grateful for every day, but Kays says that sometimes her clients give her pushback on that. If you’re going through a rough time or suffering from a mental illness like depression, it may seem like there is nothing at all in your life that makes you feel grateful. For people who feel this way, Kays suggests starting with just one thing. It might be as simple as the fact that you’re still breathing, or that you were able to get up this morning. What Is Mindfulness, and How Does It Make a Difference? So, aim for longevity. Like exercise, this is a habit that won’t produce benefits unless you keep doing it. 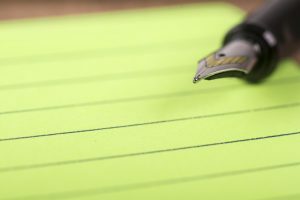 Of course, turning gratitude journaling into a routine can help you remember to do it, but don’t be so rigid about it that it becomes a chore—or a stress unto itself. Don’t beat yourself up if you skip a few days. Don’t worry about doing it at the same time every day. Just do it as regularly as is reasonable for you. It’s okay—even desirable—to focus your gratitude journal on “the little things.” The key is to train your brain to notice details that make life just that much more pleasant: a warm breeze, an unexpected smile from a stranger, a hug from a child. It helps to be as specific as you can. Instead of writing, “I’m grateful that my co-workers are nice to me,” try to think of a specific thing someone did that made you smile, even if it was just refilling the coffee machine or passing you a pencil during a meeting. One useful twist to gratitude journaling is to write a gratitude letter to someone you care about. Be as specific as possible about what the person has done for you and how you benefited from it. For an added boost, try hand-delivering the letter when possible, reading it aloud to them, and watching their face as they listen to your words. If writing just isn’t your thing, it doesn’t mean you have to miss the gratitude boat all together. Just find another way of expressing your gratitude—maybe paint a picture of someone you love or something you appreciated that day, like a sunset. Or capture it with a photograph. Perhaps make a small gift for a friend to express your gratitude for a recent favor. There really is no wrong way to bring gratitude into your life. Find the method, the way that feels right for you, that best helps you get in touch your gratitude. Alison Palkhivala is author of a new health report, Positive Thinking, published by University Health News. It becomes available in early 2019 at our Health Reports page. brain, coffee, depression, exercise, gratitude training, health, health news, mental illness, mindfulness, mood, personality, report, sleep, stress, university health news, what is mindfulness.